Mike Smith (@smittypa) of Mike Smith Public Affairs talks about his work on the Obama Campaign and the months leading up to US presidential election at 2009 PRSA international Conference in San Diego. 01:01 -- How citizen journalism and viral communications worked to advance the Obama Campaign. A discussion of the boot camps which were held by the Obama campaign to energize the base, communciate the message and the campaign trail from Iowa to Virginia. O2: 07 -- His experience canvassing door-to-door in freezing cold weather in Iowa. The single biggest lesson this 27-year-old public relations person learned from the campaign and the importance of putting the voter first. 02:56 -- Sacrificing the niceties of PR and creating bonds with voters based on a working knowledge of each voter's background. 03:29 -- Rather than focus on communicating directly with everyone, the Obama campaign's strategy, which identified and focused on the influencers within their communities, and leveraged their support to achieve broader outreach. 04:33 -- Why the Iowa caucus is so significant in US presidential elections. 06:14 -- How the Obama campaign was able to attract and organize so many volunteers, and why the Des Moines Register was more important than The New York Times. 07:24 -- Working with field organizers and how the Obama strategy focused on getting college students back from Christmas break in time to vote. 08:24 -- Fifty million in one month was an all time record for fund-raising on the Internet, and since it came from mostly $100 donations, the campaigns populist message was drawn from the micro-payments story. 09:26 -- The role of Blue State Digital and the Web team on the Obama Campaign, and how they mobilized the enthusiasm of their social media followers. 10:16 -- Learning to Tweet from Craig Newmark (featured in a previous episode of this podcast) and integrating Twitter into the Obama Campaign. 11:04 -- Craig Newmark's advice on determining who to follow, and a little know fact about Craig's political allegiance. 13:13 -- Self-identification on social networks with respect to political affiliations and whether or not that is or is not a good idea from a professional standpoint for public relations and public affairs practitioner. 14:05 -- Determining how and when to disclose one's political preferences in an online social environment. Where does my life end and the corporate life begin? 15:11 -- Wrestling with how much disclosure and transparency is appropriate on the Internet with social networking tools. @EricSchwartzman provides online communication training, strategy and governance to public relations, public affairs, corporate communications and marketing specialists. He has extensive experience integrating emerging information technologies into organizational communications programs through public speaking, hands-on training seminars, consulting and the development of corporate policies on social media usage. His clients have included Boeing, BYU, City National Bank, Environmental Defense Fund, Government of Singapore, Johnson & Johnson, Southern California Edison, Toyota, UCLA, US Dept. of State, United States Army, US Embassy of Athens, the United States Marine Corps and many small to medium-sized companies and agencies. Schwartzman is currently co-authoring a book on business-to-business social media communications with Paul Gillin, to be published by Wiley in Fall 2010. He is the instructor behind PRSA’s top-rated social media and emerging treads training seminars, the New Media and Social Media PR Boot Camp and the New Media and Social Media PR Master Class, which are offered monthly in the US through PRSA. Since 2005, he has been producing the weekly, award-winning public relations podcast “On the Record…Online” (@ontherecord) about how technology is changing the way organizations communicate, the official podcast of the PRSA International Conference for the past three consecutive years. 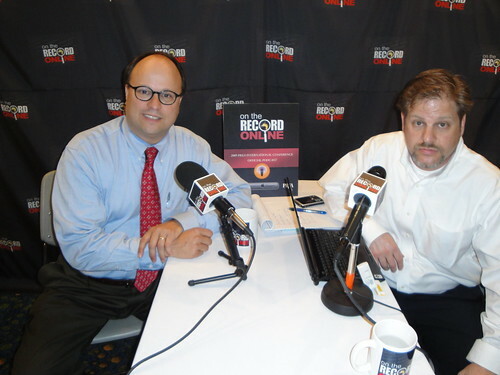 On the Record…Online is the Official PR Podcast of the 2009 PRSA International Conference. Subscribe via RSS or follow us on Twitter@ontherecord and get them as soon as they’re released.